This is part two of PPC series post. Part 1 talks about PPC terms you should know. First step in creating a PPC campaign is to perform keyword research. However, before we unveil the tools and techniques you need to learn about “Quality Score”. Quality score is a score assigned by two biggest PPC networks: AdWords (Google) and AdCenter (Bing-Microsoft). The score is aimed at determining how relevant and thus useful to users your ads are. It easy to see, that if you have a higher quality score, your ad will be displayed in more preferable positions and you will pay less per click. It is estimated that AdWords campaign with lower quality scores can be up 600% more costly than campaigns with optimized Quality Score. We will go over these factors in depth through the course of these PPC series. For this step you should pay attention to “Keyword Relevancy.” The keywords you are going to research in a next step need to be precise and relevant to your target groups. The key lesson to be taken from this post is when you start researching for keywords – avoid the temptation of including inexpensive, but low relevancy keywords in your research. These keywords might spoil your whole campaign. 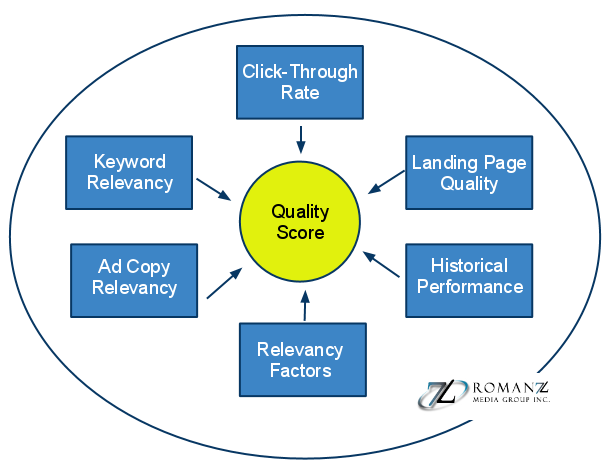 Also, as you can see the success of your PPC campaign is partly dependent on all of the factors of Quality Score system. That is why during the next lessons of these series you should keep in mind these graph. If you have any questions in regards to Quality Score you can ask me on Twitter @romanz or by leaving a comment here. Consider also Liking this post (button bellow) and our main Facebook Page we would appreciate it, plus you will have an access to unique Facebook only content.